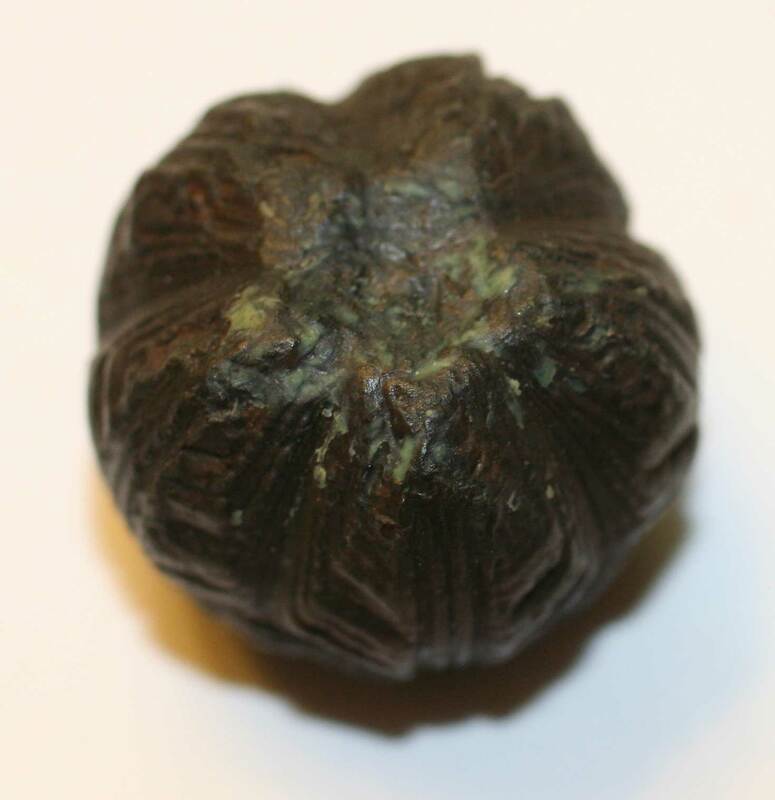 These pictures represent my first attempt at photographing a charophyte fossil. The microscope is using a mixture of Celestron lens for a telescope to get different magnifications. The one used for these pictures is 46x. This specimen is from the Isle of Wight off the coast of England. 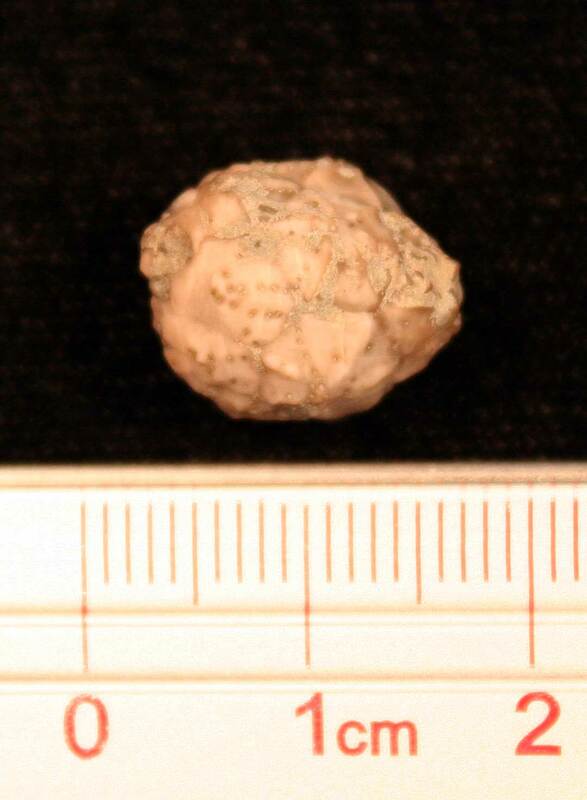 It is probably from the Eocene or Oligocene. 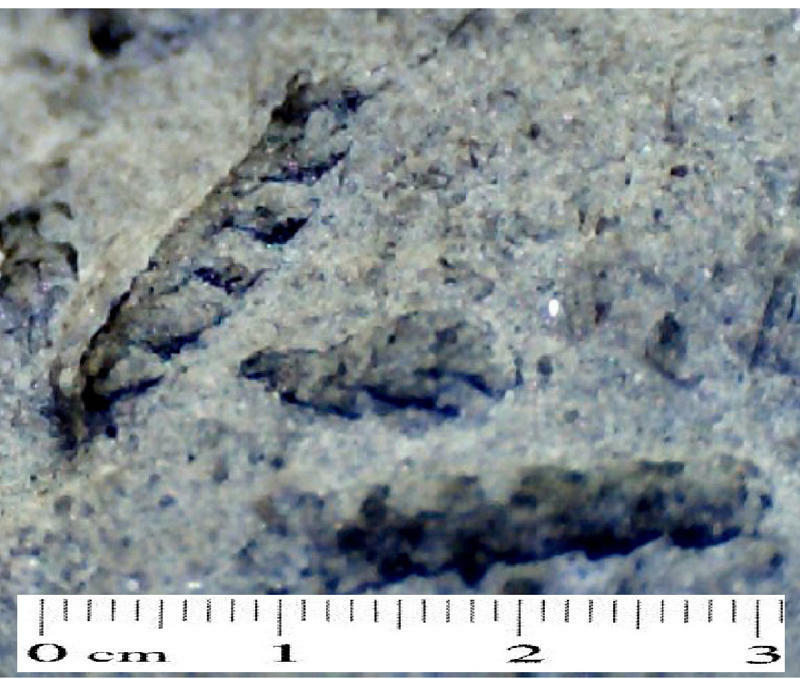 Looking at a paper by Monique Feist-Castel entitled Evolution of the Charophyte Floras in the Upper Eocene and Lower Oligocene of the Isle of Wight (1976), this fossil might be some sort of Harrisichara sp. Thanks to Dr. James Conkin of Louisville, Kentucky for letting me take pictures of this specimen. 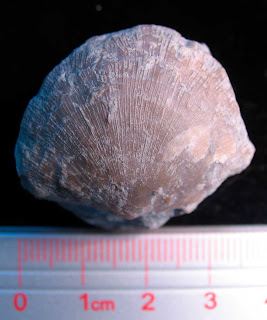 Silurian Reef Database from The Field Museum on Vimeo. 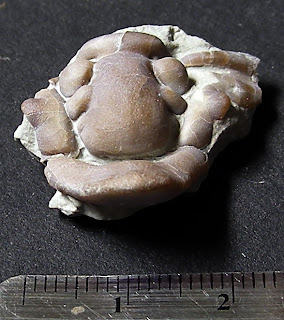 Here is an interesting video from the Fossil Invertebrate Department of the Field Museum of Natural History in Chicago, Illinois. A summer 2011 intern named Alex Lang(?) 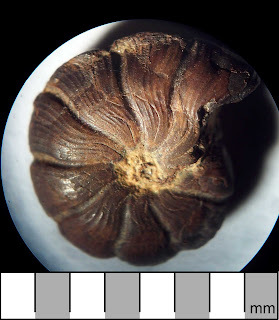 is the narrator and describes his task of cataloging Silurian fossils into a computer database. He states in the video that only 278 invertebrate fossil specimens are on display of over the 2 million in the collection. The collection is cataloged on books that began with the 1893 Columbian World Exposition in Chicago. Hopefully, they have transcribed the handwritten volumes and keep a copy in a fireproof safe. Better would be to photograph the volumes and store them digitally in various places around the world. 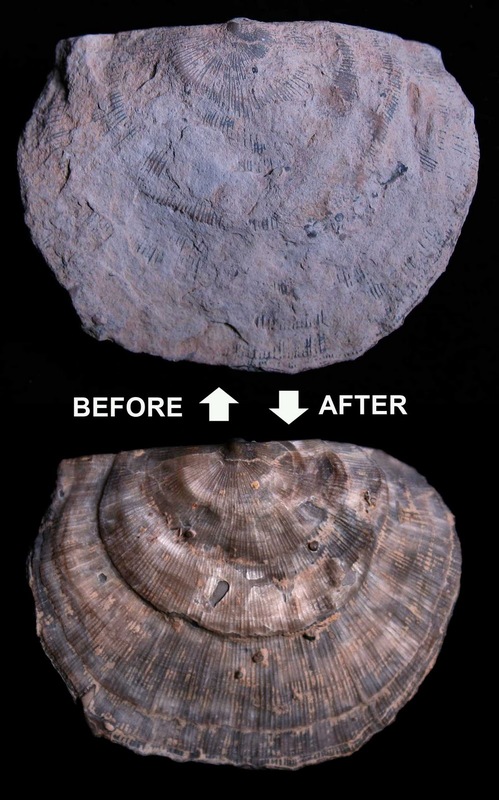 Louisville, Kentucky and Chicago, Illinois both sit on top of the remains of ancient Silurian reefs. 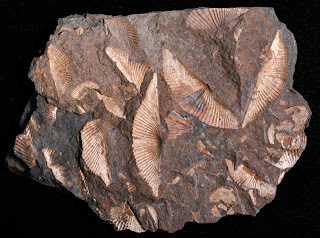 The Field Museum also has links to this area in its relationship between local mining tycoon and geologist/paleontologist William Borden. His approximately 30,000 piece fossil collection was transferred from New Providence (Borden), Indiana to the Field Museum in 1923. William Borden and Marshall Field were partners in mining interests in Leadville, Colorado as well. 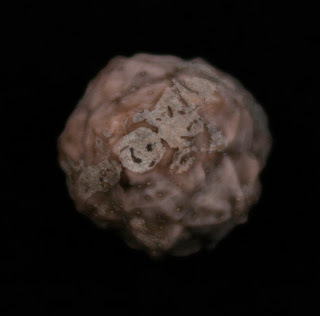 See my post about Mr. Borden for more info: http://louisvillefossils.blogspot.com/2009/11/borden-institute.html. 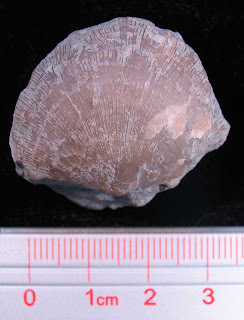 Pictures of a Mucrospirifer brachiopod plate of unknown origins. 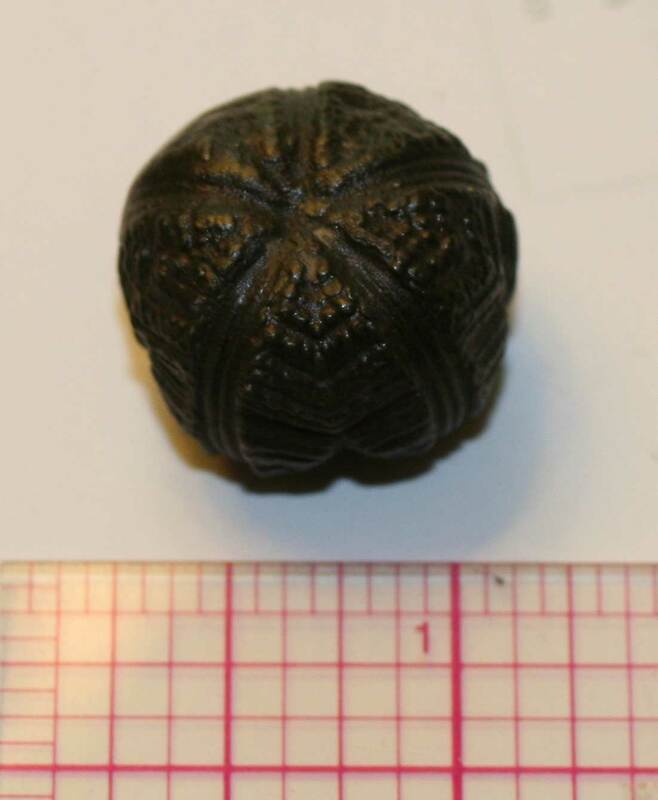 It did not have a label with it. 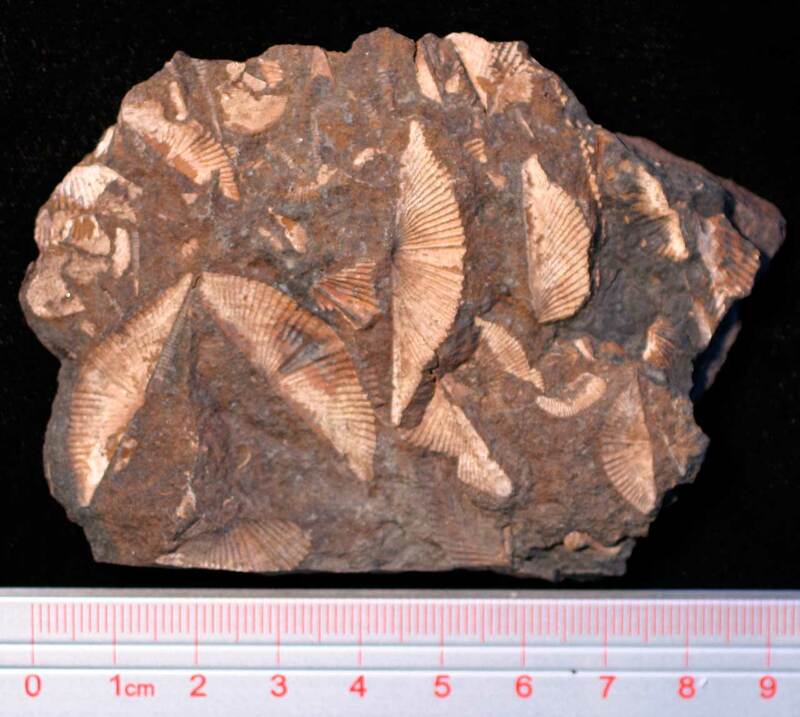 I like the contrast of the fossils with the brown matrix. When traveling I am asked where I live, my answer is Louisville, Kentucky, where the Kentucky Derby is run. In most cases, people have heard of this famous horse race. The Commonwealth of Kentucky is internationally known for its thoroughbred horses and the beautiful farms on which they roam. So it is exciting that the American Museum of Natural History has organized an Kentucky exhibit "The Horse" which shows "how nature's most majestic creature has shaped our world." 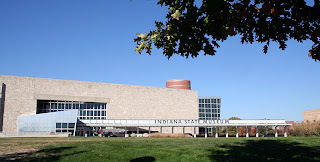 The Kentucky Horse Park's International Museum of the Horse (IMH) in Lexington will host this exhibition from October 22, 2011 through April 6, 2012. 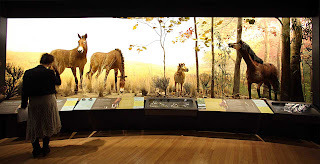 "The Horse" exhibit consists of six sections: The Evolution of the Horses (showing fossils); Horses and Hunters, Domesticating Horses; The Nature of Horses; How We Shaped Horses and Horses Shaped Us; and An Enduring Bond. 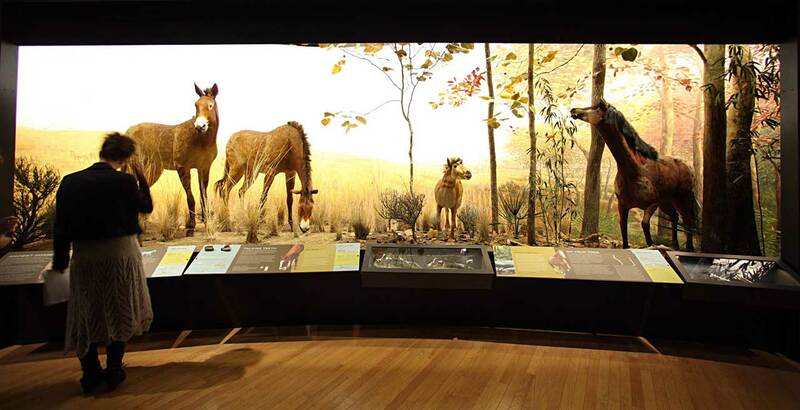 The image of the diorama of wild horses is courtesy of the Kentucky Horse Park. 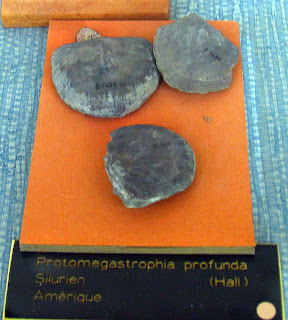 While horse fossils are not found in most of the state, the displays at museum will present some to view. 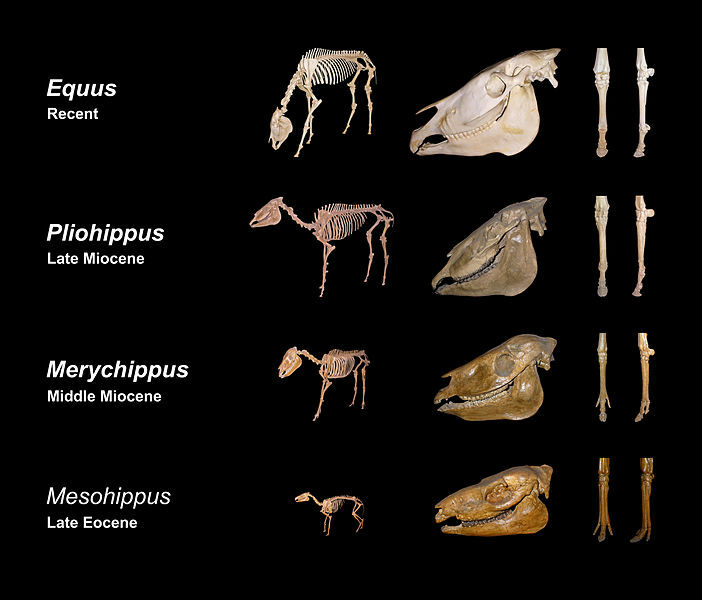 Some idea of how the horse evolved can be seen in the next image. For more information on “The Horse,” go to www.amnh.org/exhibitions/horse/, www.imh.org, or www.kyhorsepark.com . Admission to The Horse is included with park admission, or a “museums only” ticket may be purchased for $8 for adults or $4 for children ages 7-12, which also includes admission to the entire International Museum of the Horse, the Al Marah Arabian Horse Galleries and the American Saddlebred Museum. Park Hours and Rates: Through Nov. 6, the park is open seven days a week. Admission is $16 for adults, $9 for children 7-12. From Nov. 7 to March 14, the park is open Wednesdays through Sundays. Admission at that time is $10 for adults and $5 for children ages 7-12. Children age 6 and under are always admitted free of charge. 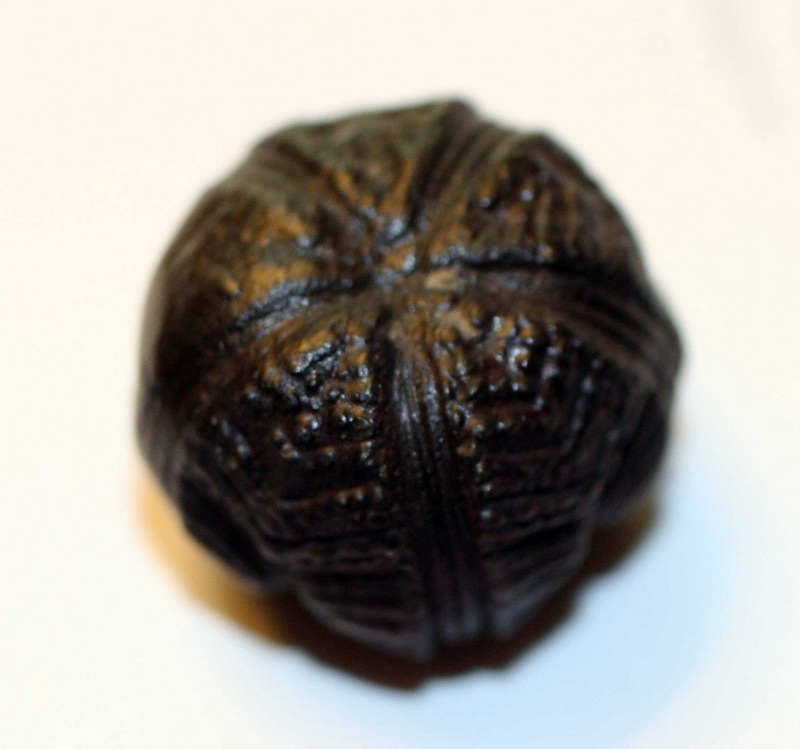 Admission includes the International Museum of the Horse – a Smithsonian Affiliate, and the American Saddlebred Museum. The Kentucky Horse Park is a working horse farm/theme park and equine competition facility dedicated to man's relationship with the horse. The park is an agency of the Kentucky Tourism, Arts and Heritage Cabinet that hosted more than one million visitors and campers, as well as 15,000 competition horses in more than 100 special events and horse shows in 2010. The park is home to the National Horse Center which comprises more than 30 national and regional equine organizations. Located at Exit 120, Interstate 75, just north of Lexington, the Kentucky Horse Park is The place to get close to horses. Open daily March 15 to Oct. 31, and Wednesday through Sunday, Nov. 1 to March 14. The physical address of the park is 4089 Iron Works Parkway, Lexington, KY 40511. 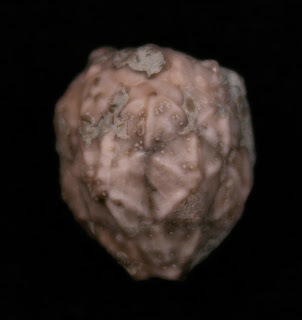 A small (approximately 2 cm tall) cystoid fossil called Caryocrinites persculptis. 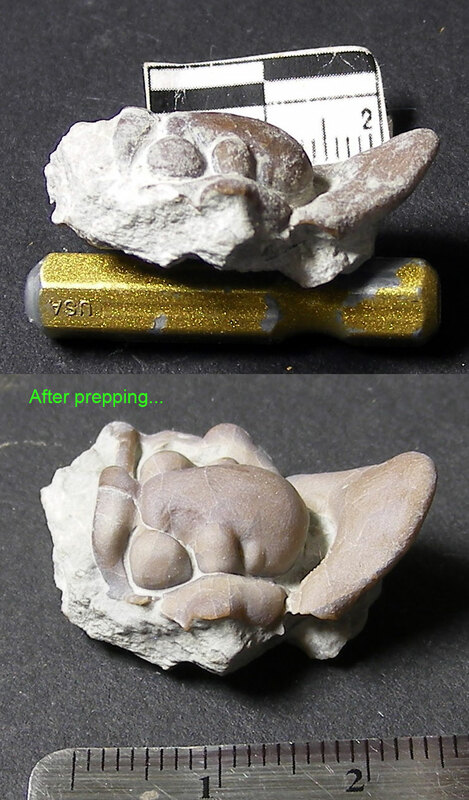 This specimen needs a little more cleaning to remove some stubborn matrix. 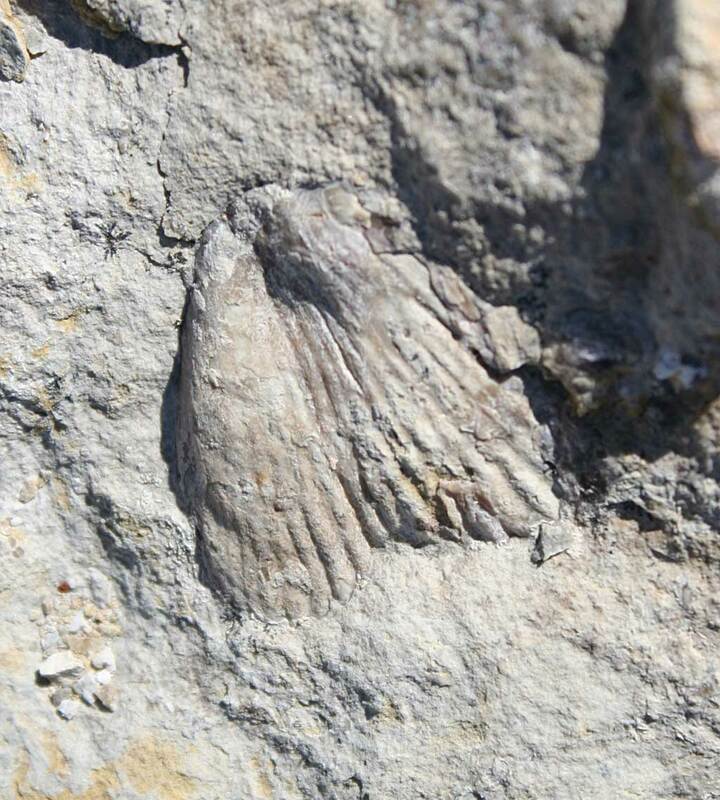 A rare Silurian fossil found in the Waldron Shale of Clark County, Indiana. 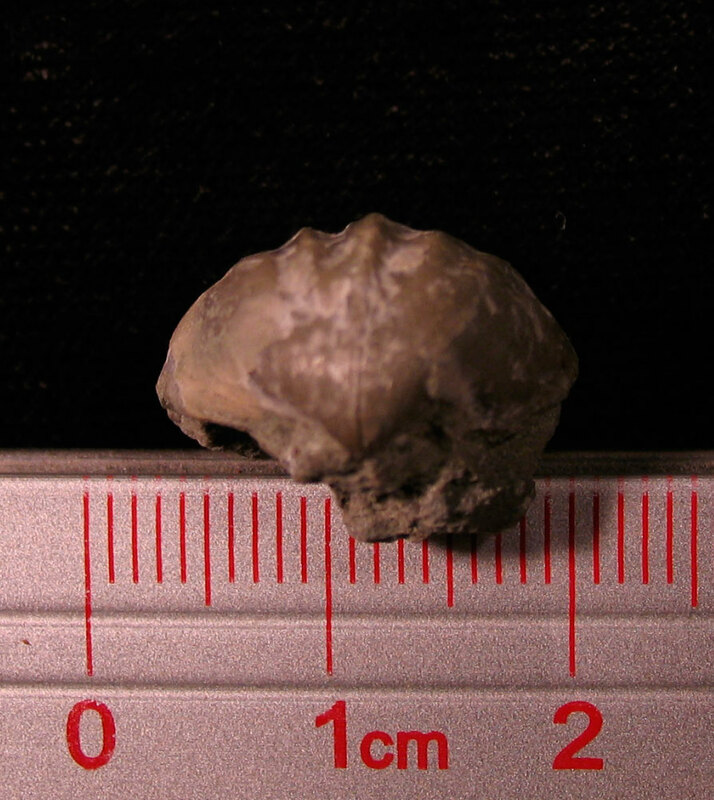 This may be one of the largest best preserved brachiopods I have ever found, measuring over 5 cm in width. It was recovered from the Silver Creek Limestone of Clark County, Indiana and appears to be a Protoleptostrophia perplana?. Originally, I thought this was a Megastrophia in an earlier posting (CLICK HERE) but Dave at Views of the Mahantango blog pointed out that error. 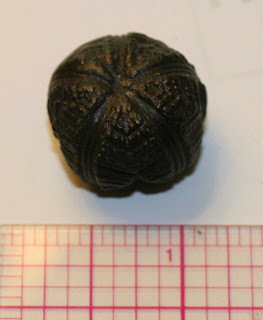 Thanks to Kenny for cleaning the matrix off this specimen with sand abrasive cleaning. 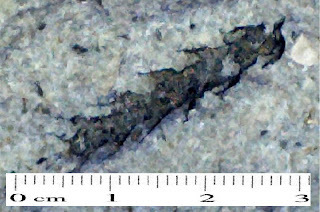 See further down in this posting for before and after pictures of both sides. It really is clean! 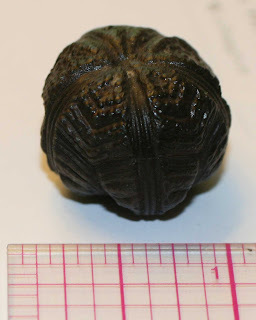 Note this genus use to be Climacograptus. See this web site for details. One thing I noticed about these fossils is they are very three-dimensional. 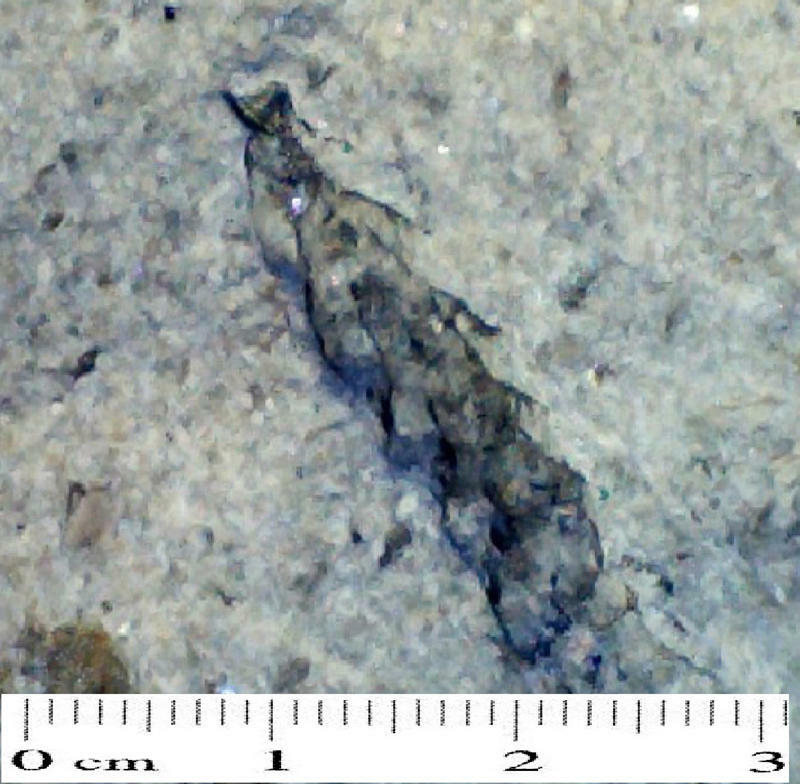 Most graptolites one finds are compressed into the matrix, these are not. Thanks to Herb for the pictures and finding this nice fossils on a recent fishing trip. Sweet! This upcoming weekend the Indiana State Museum hosts its annual GeoFest which has lots of fossil and mineral experts on hand to answer questions. 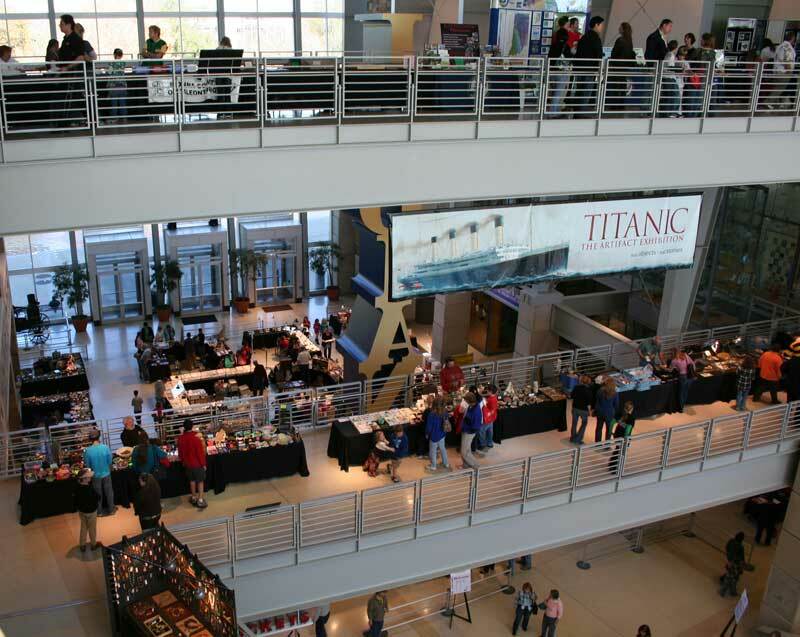 In addition, dealers will be selling minerals, fossils, jewelry, books, tools, and assorted geological items. Visitors get into the show with admission to the museum. While in the museum, check out the world-class exhibits about all things INDIANA! 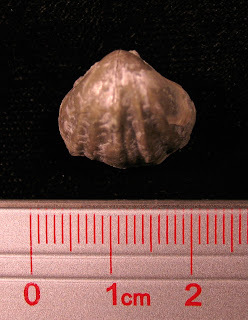 Somewhat rare brachiopod fossil found in the Silurian Louisville Limestone which is known more for its corals. 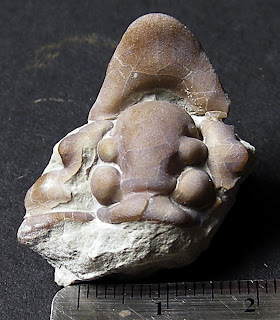 This fossil appears to some sort of Pentamerus but after some research it might be a Rhipidium knappi named by Hall and Whitfield. The Index Fossils of North America names it being found in Kentucky (Louisville Limestone) and west Tennessee (Brownsport). Might also be under the name Hall gave in in 1872 as Pentamerus knappi or his 1875 identification Pentamerus nysius var. 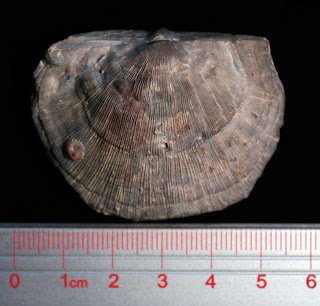 crassicostus. This fossil appears to be a Nereidavus invisibilis? 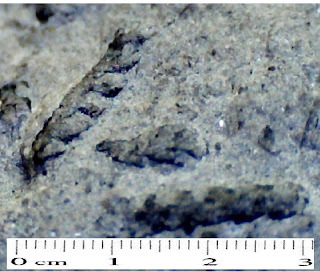 scolecodont found in the Silurian Waldron Shale of Clark County, Indiana, USA. 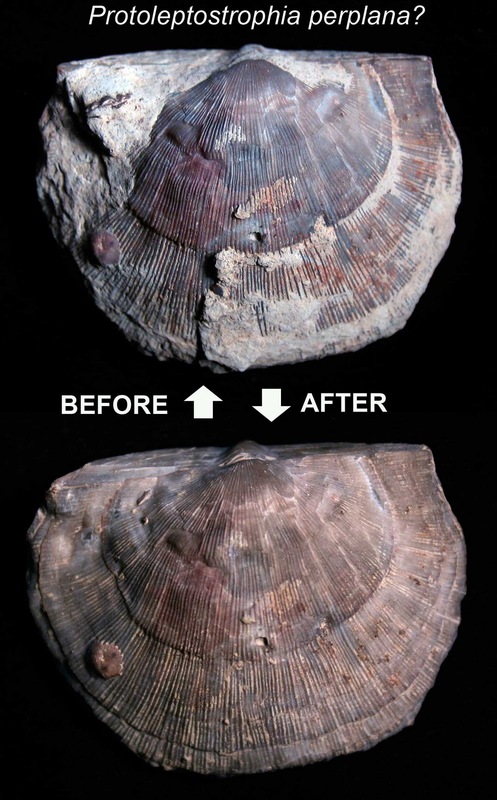 The fossil was found on top of another fossil as can be seen in the second picture. 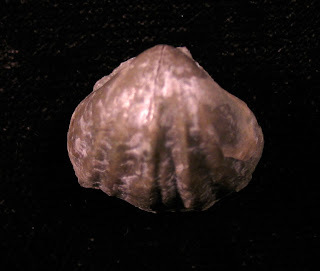 The second fossil is a crinoid holdfast. 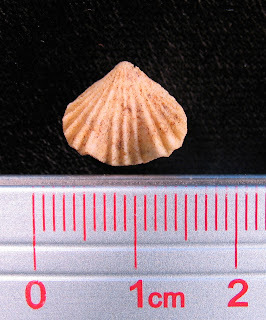 Thanks to Kenny for the pictures and identification. 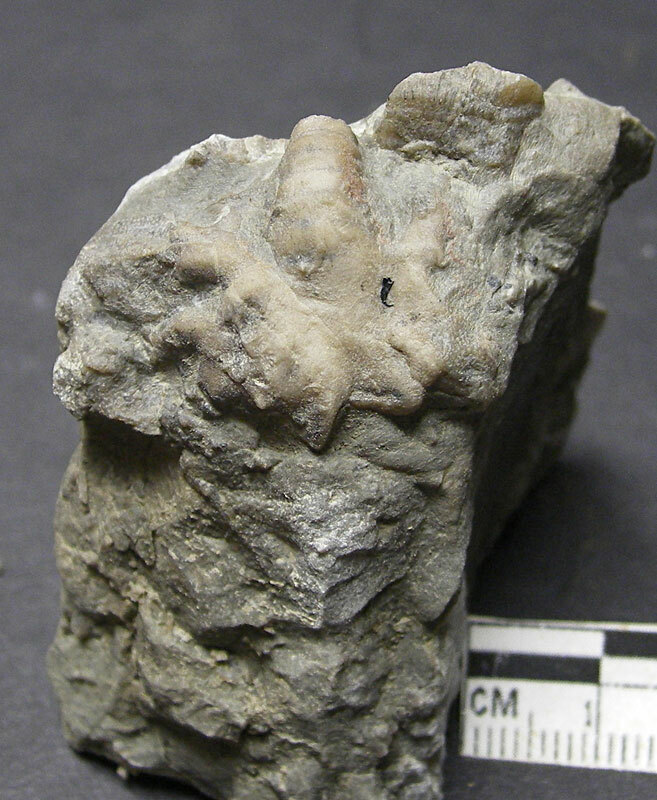 See other possible scolecodonts found in the Waldron Shale: CLICK HERE and CLICK HERE. 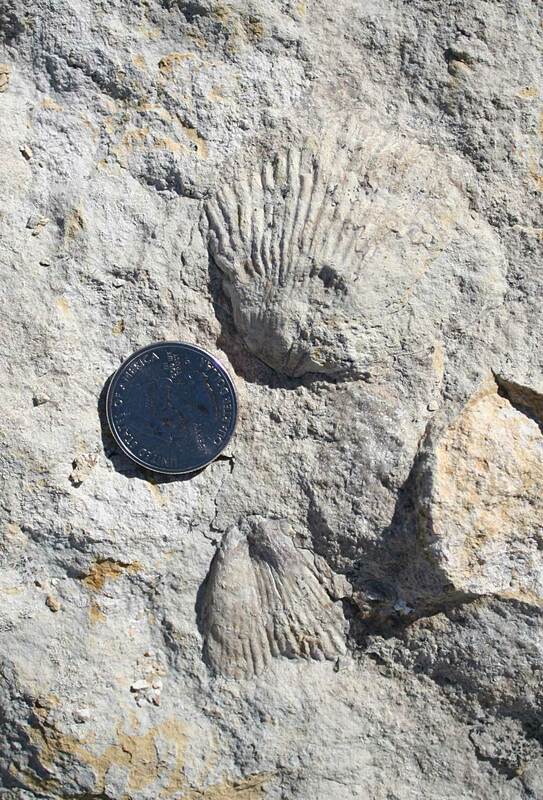 It's National Fossil Day™ in the United States. There are no events planned in the area where I live. Even so, I will try and find a fossil or something to commerate the day. 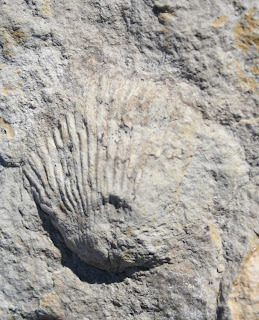 Note National Fossil Day is a trademark of the National Park Service. 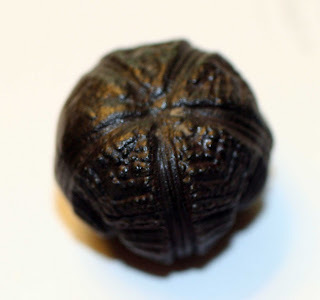 Today's posting is a super rare treat! 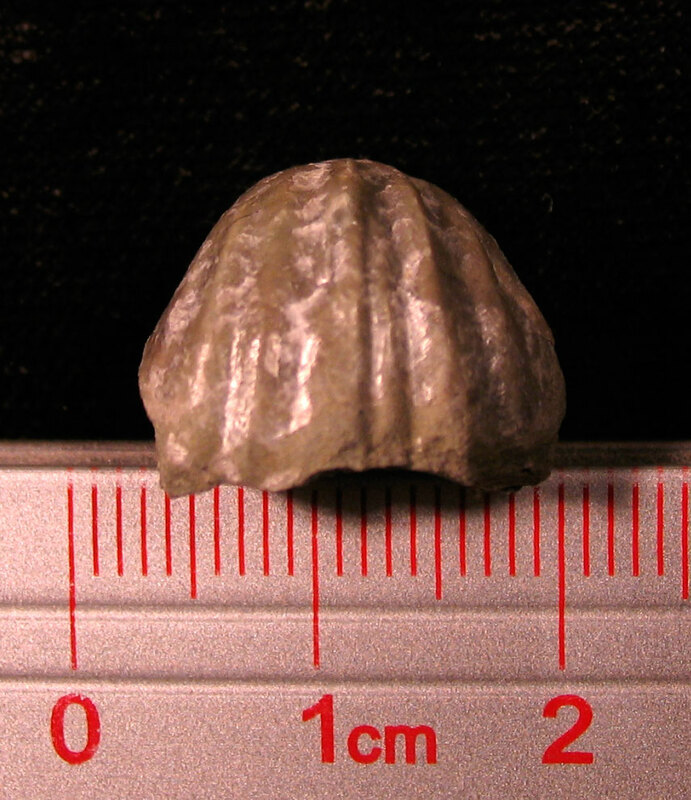 The fossil shown here is a paratype of the blastoid Orbitremites kentuckiensis. 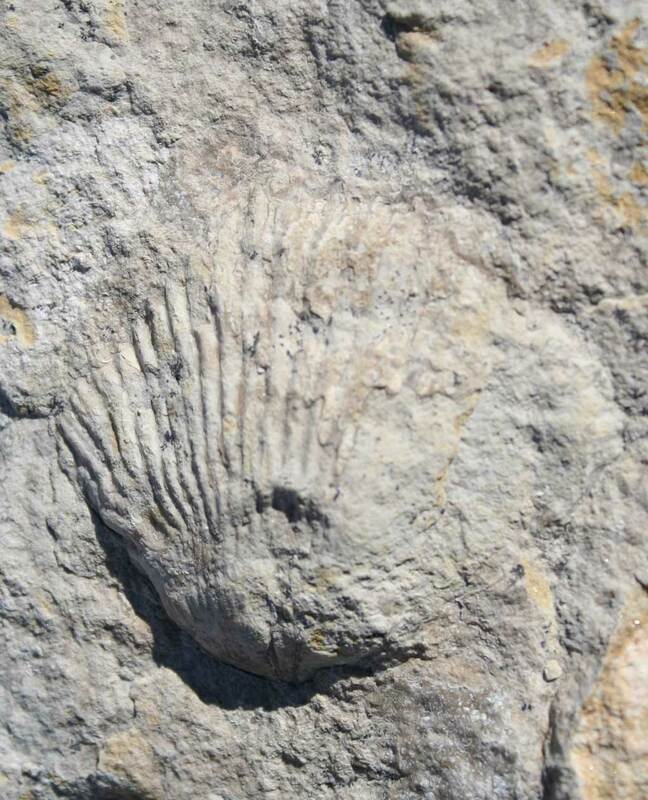 This fossil is one of two left in the personal collection of Dr. James Conkin who named it. 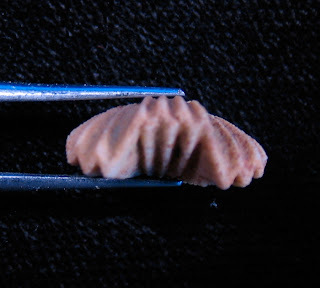 The holotypes are stored at the Smithsonian National Museum of Natural History (USNM PAL 127316): CLICK HERE TO SEE. 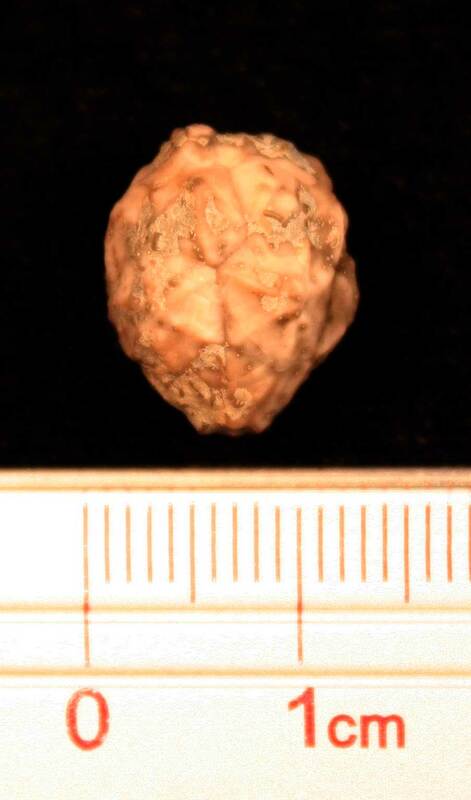 Amazingly, the Smithsonian has imaged these specimens in their database. 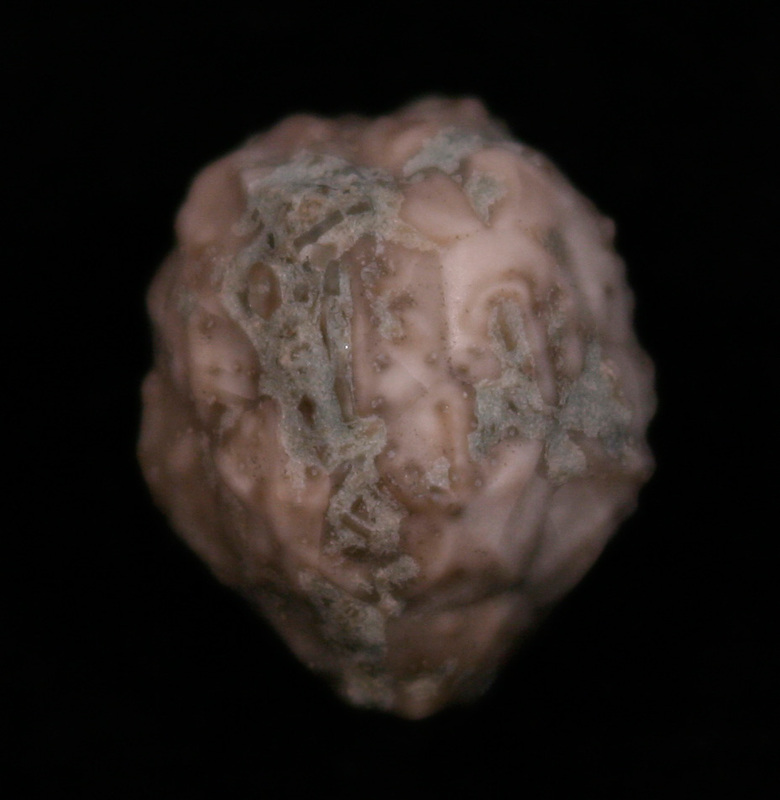 It is rare that I find specimens in their HUGE database that have been imaged. 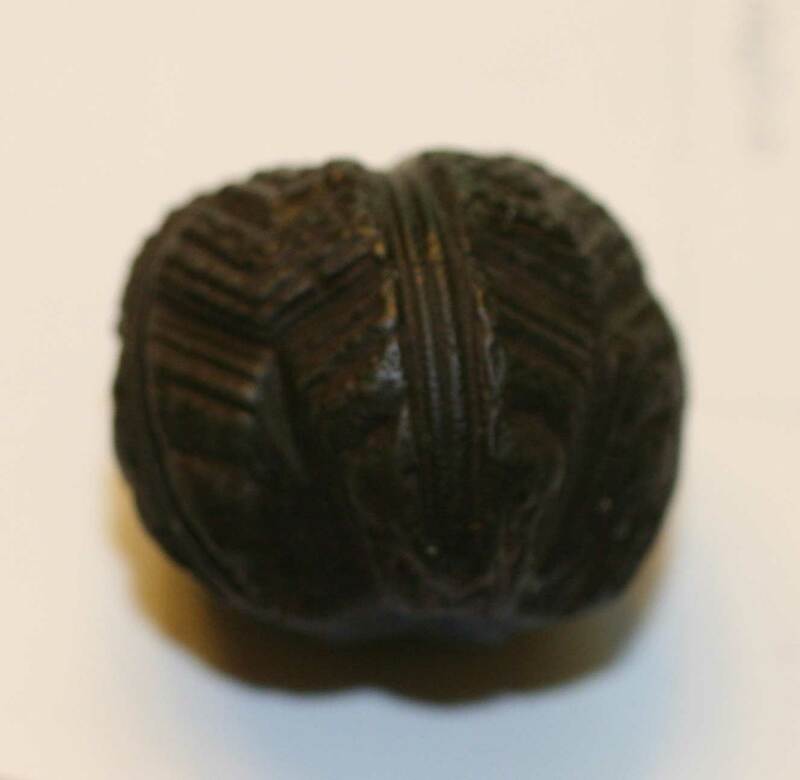 Maybe they like pyritized blastoids which appear to be very rare. 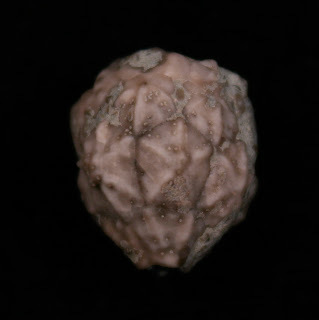 The fossils might also consist of marcasite which if not properly stored can break down (pyrite disease) into melanterite and sulphuric acid. 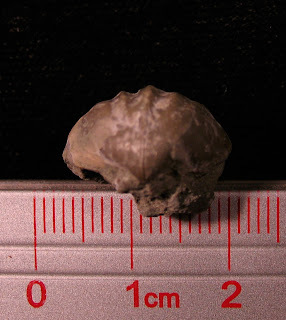 Dr. Conkin tells the story of discovering the Coral Ridge Member (New Providence Formation or Knobstone Group) of Jefferson County, Kentucky, USA in 1957 and the pyrite fossil fauna there in his 2006 paleontological memoir "I SEE... WONDERFUL THINGS" on pages 101-103. He describes the area as "a frozen paradise of former life." 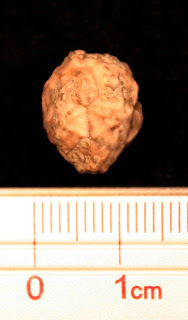 The book contains a bittersweet story about what happened to the third paratype specimen as a squirrel mistook it for a nut. This is a very interesting book filled with images of fossils and stories of how they were found throughout his long career. The locations range from China to throughout the United States (e.g. Kentucky, Indiana, Tennessee, Texas). Dr. Conkin also found another new species of this blastoid named Orbitremites coralridgensis. 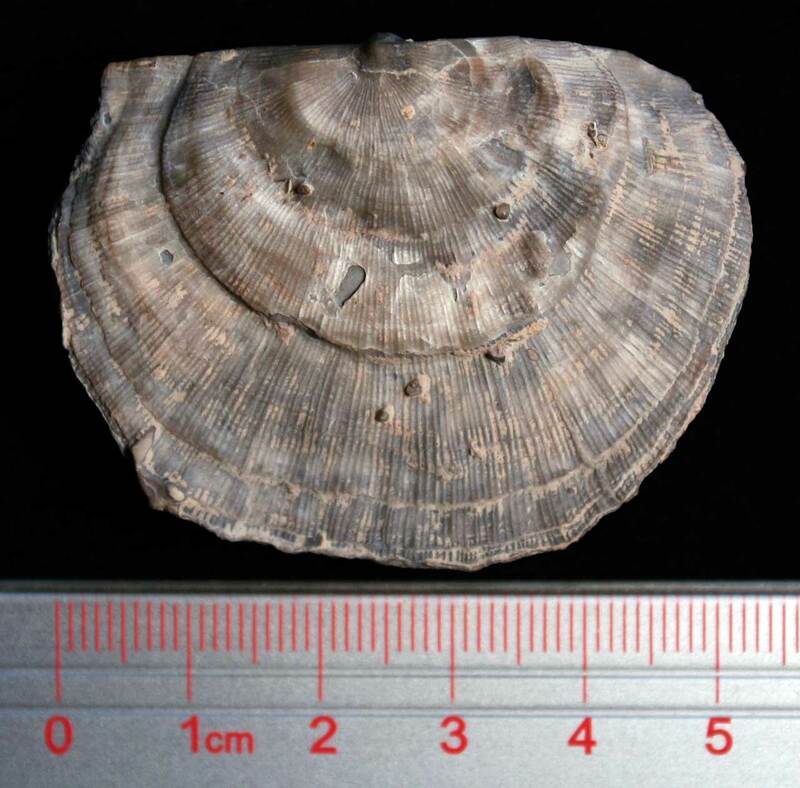 The holotype (USNM PAL 127324) can be seen at the Smithsonian collection web site: CLICK HERE. 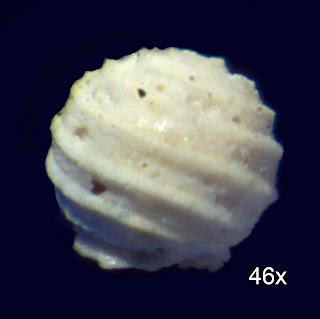 Note the genus may now be known as Globoblastus. 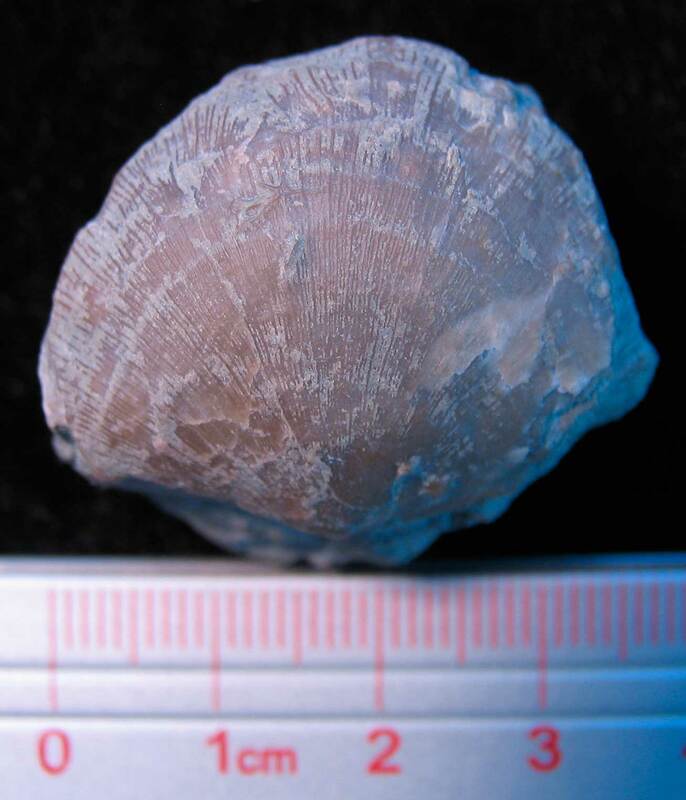 E-mail me at louisvillefossils@gmail.com if you need help getting in contact with them. 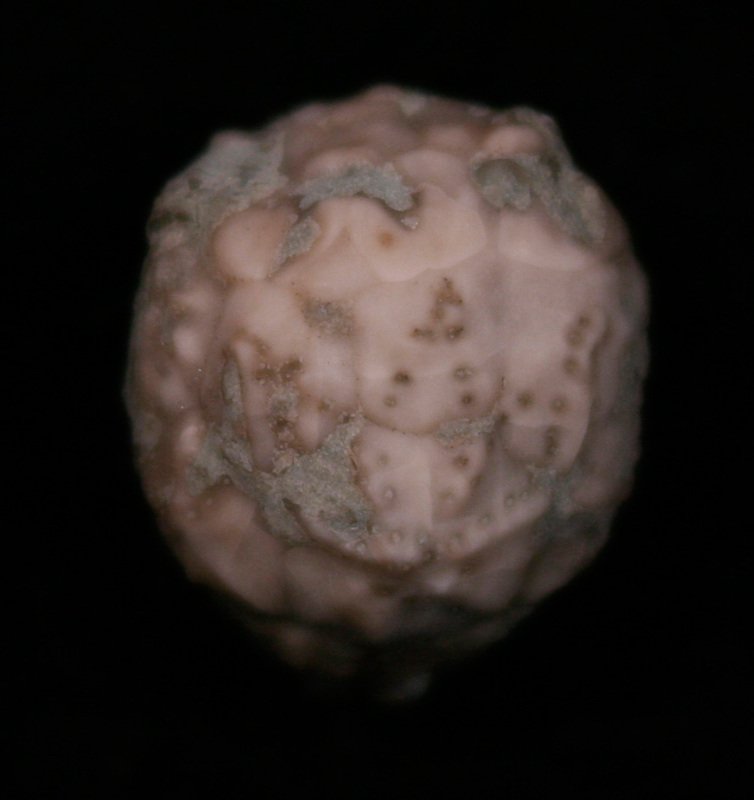 Thanks to Dr. Conkin for letting me photograph this fossil specimen. 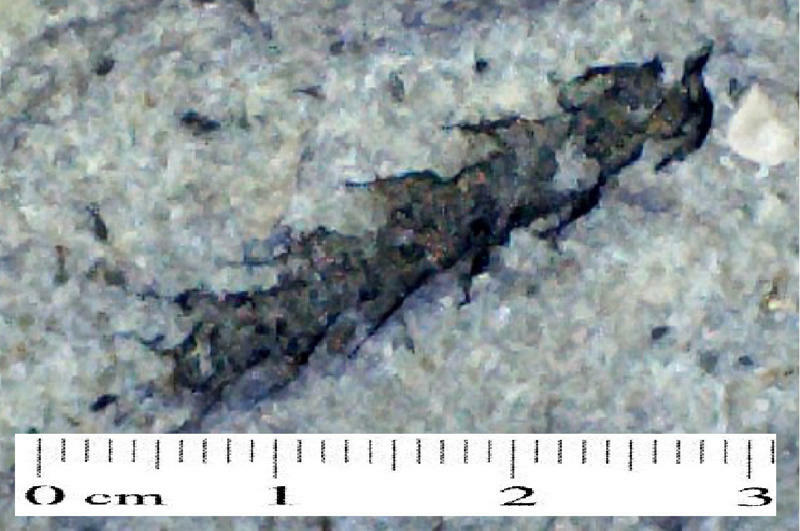 Note fossil has been coated to help prevent marcasite breakdown. Here are some pictures of a trilobite cephalon that has been cleaned. It was found in the Silurian of Indiana. 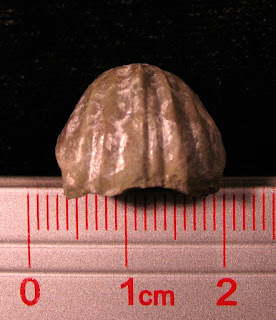 The trilobite might be a Spathacalymene nasuta?. 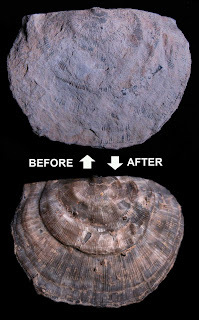 Next pictures shows a before and after cleaning of this fossil. 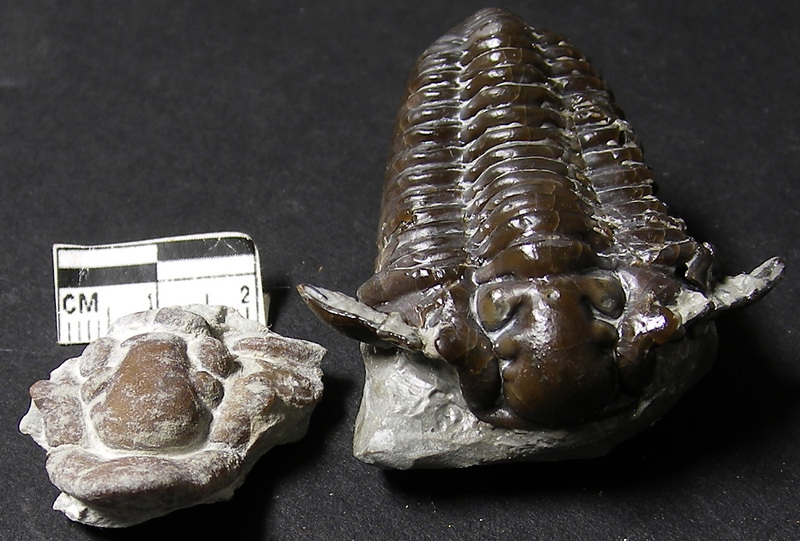 The last picture shows a comparison between the Spathacalymene and Calymene trilobites. That trilobite really must have been a real digger with that front scoop on its cephalon. Thanks to Kenny for the pictures and good job on cleaning this little fellow up. 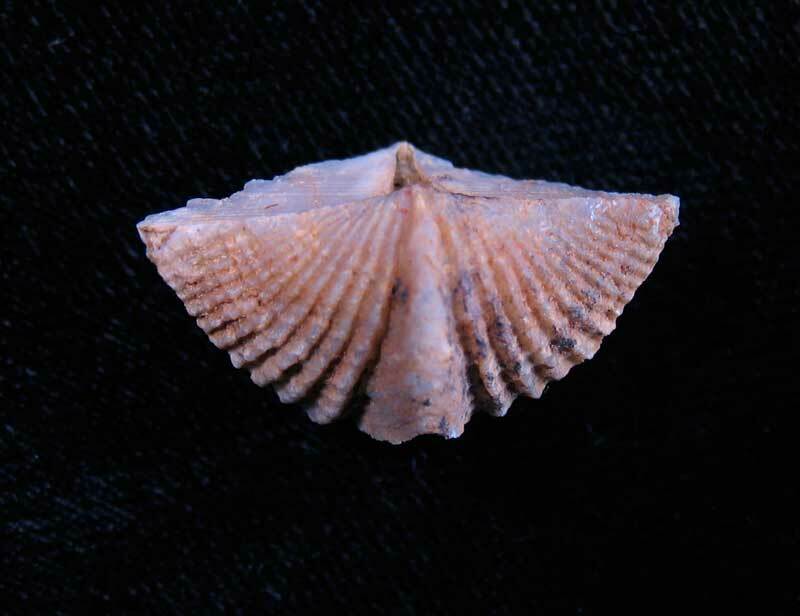 Protomegastrophia profunda brachiopod fossil of the Waldron Shale of Clark County, Indiana. This Silurian brachiopod genus Protomegastrophia was named by Caster in 1939. 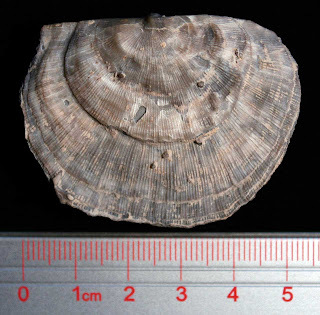 This same person named the Devonian Megastrophia that can be seen HERE. 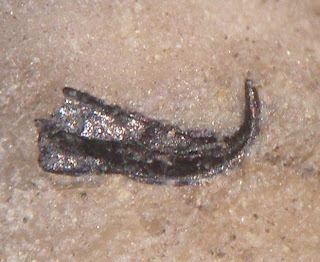 The Smithsonian web site list the genus under another name of Brachyprion. This is the 18th brachiopod I have identified of the Waldron Shale, see the list HERE. 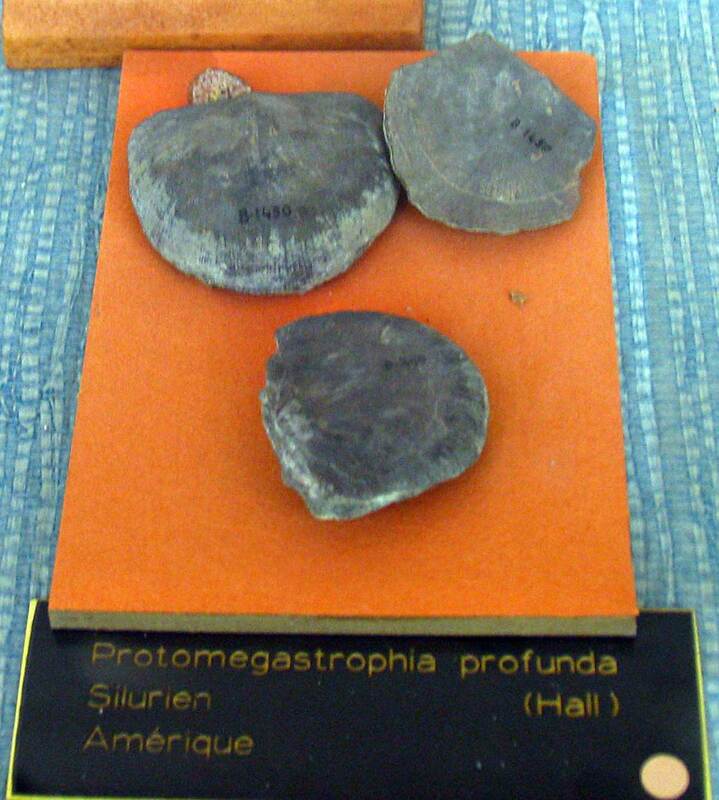 Here are some of the species on display at the Muséum National D'Historie Naturelle Jardin Des Plantes Paléontologie et Anatomie Comparée in Paris, France. 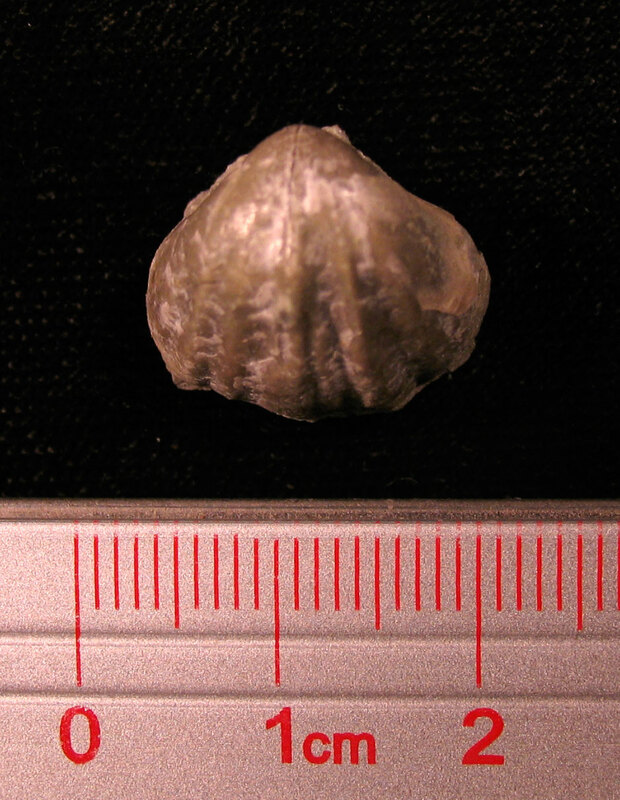 The Orthorhynchula linneyi brachiopod found in the Lexington Limestone of Boyle County, Kentucky. Creature existed in the Ordovician (505-438 million years ago). This fossil is a real treat. It is a Polaricyclus conkini and found in the type locality of Coral Ridge, Jefferson County, Kentucky. 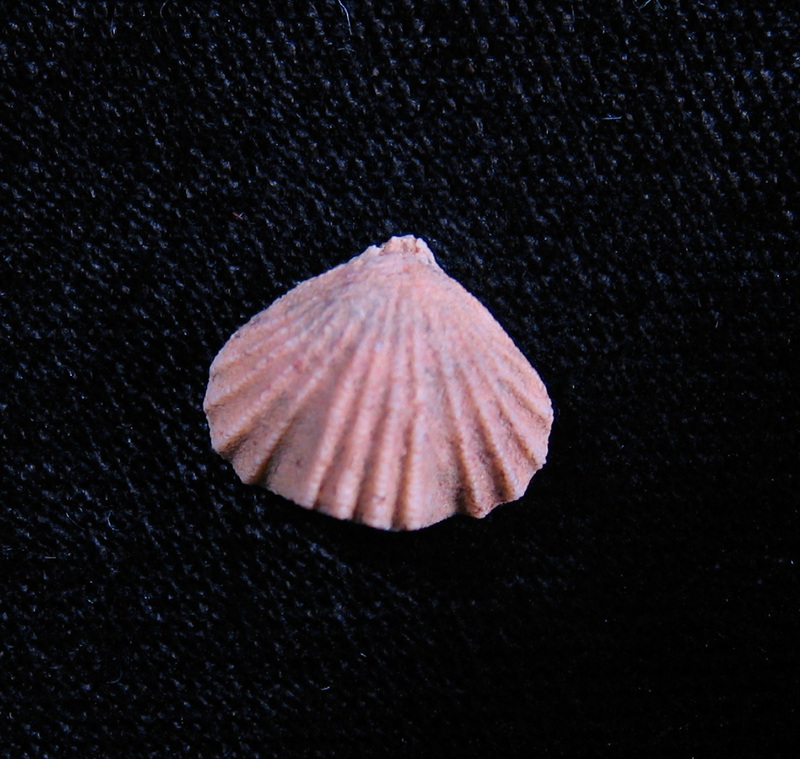 The species is named for Dr. James E. Conkin, professor emeritus at the University of Louisville. 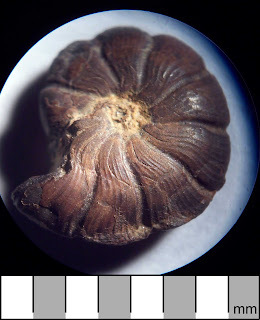 Fossil was named by David Work (Maine State Museum) and Charles Mason (Morehead State University) in their 2004 paper Mississippian (Late Osagean) Ammonoids from the New Providence Shale Member of the Borden Formation, North-Central Kentucky in the Journal of Paleontology. See paper: CLICK HERE. 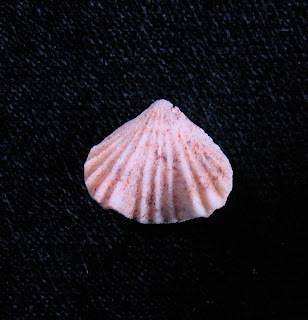 Dr. Conkin discovered the Coral Ridge Member in the 1950s during thesis work at the University of Kansas. It is neat to see a fossil found in the Louisville area and named for a local geology professor. This pyrite fossil was found in the Coral Ridge Member of the New Providence Shale. Thanks to Alan for letting me purchase it. 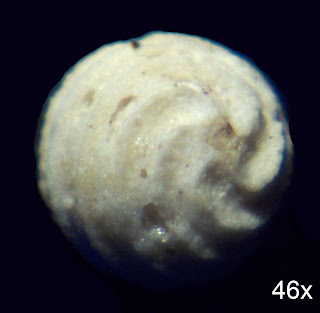 Images take using microscope at 23x and 8 mm field of view.